(Bloomberg) -- There’s a Swedish hedge fund that’s decided to ignore Brexit and bet on the pound in a move it hopes will help it keep outperforming its peers. Informed Portfolio Management, which is based in Stockholm, has delivered better returns on its currency bets than the benchmark index against which it measures its performance. The risk that Britain might crash out of the European Union isn’t enough to stop IPM from believing in the pound. IPM, which defines itself as a systematic macro fund, says the pound remains undervalued even after its rally against the dollar this year. It thinks the smart money will ignore the hysteria around Brexit and position itself for continued pound gains. “We are no experts on discretionary trading but I believe the probability of a catastrophic scenario is quite low, though that possibility is weighing on the pound,” said Bjorn Osterberg, the chief investment officer and head of research at IPM. 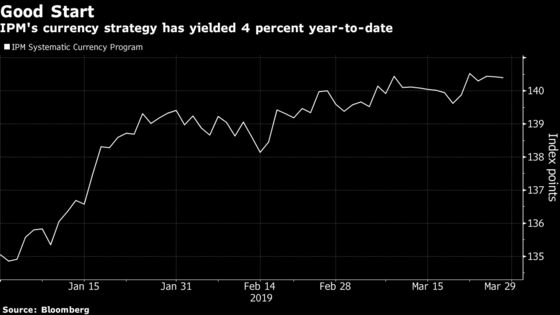 The firm delivered 4 percent on its currency strategy so far this year, in U.S. dollar terms. By comparison, the BarclayHedge Currency Traders Index has fallen 0.2 percent. IPM has recently changed its view on the dollar. It went short the greenback this year, after winding down its long position in 2018. The dollar just looks too expensive, given the economic backdrop, according to IPM. IPM is short Sweden’s currency. “We agree that the krona is undervalued but the macro backdrop is more than enough to tilt the balance to the krona’s disadvantage,” he said. But the fund likes the Japanese yen, with low inflation adding to the appeal of the currency. “We try to forecast investment flows and they are set to be positive for Japan and the yen and trade flows look decent too” said Osterberg.